The walks programme has been updated (10/4/19) so please download the latest version. 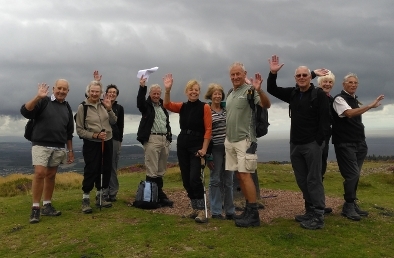 The Curry Rivel Footpath Group is a group of "Casual" Walkers. We meet up at a different pub each Saturday morning, place our order for food, and at 10.30 set off on a 4 - 5 mile leisurely walk. We are then back at the pub for lunch and possibly even a drink! Most members take it in turn to plan and organise a walk and are then the walk leader for that week. We very much welcome ideas for new walks, however the social side of meeting together and chatting as we walk along is almost as important as the walk itself. So, why not come and join us for as many or as few walks as you wish. We have a poet amongst us so click here to see a light-hearted account of some of our recent walks! Our membership is centred around mid Somerset, so our walks tend to be around this region. The black dots on the map opposite show the spread of walks on a typical three month programme. 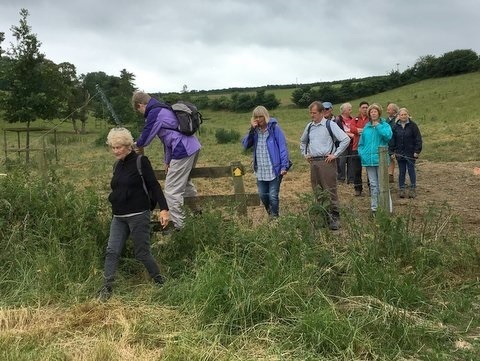 The group walks throughout the year; we are a hardy lot, although the walk leader may opt for a slightly shorter walk if the weather is really bad. To see our current walk programme click on walks. The group usually organises a number of social events each year. The Annual Dinner is always very popular and on alternate years we either hold an American Supper, or a skittles evening. to ask us a question, click on contact us.